While I consider myself more of a fall and spring kinda girl, there’s a lot of things I really do love about summer. Farmer’s Markets lined with colourful, fresh produce, a mid-day nap in front of the fan, and eating fruit by the pound (literally – last year Jordan & I demolished a 5lb box of blueberries within just a couple of days, and our 10lb box of peaches didn’t make it past a week). But to me, one thing truly signifies the arrival of summer. As soon as the weather starts warming up I switch my regular Starbucks americano for iced, waiting not-so-patiently for their cold brew coffee I love so much. Once it’s in store I’m drinking venti iced coffees like it’s goin’ out of style. Throw in a few iced lattes and caramel macchiatos and a light frappuccino or two here and there and I’m one happy lady. But not only is my Starbucks addiction not so good for my wallet, it’s not the best for my waistline. Caramel macchiatos and frappuccinos are a no-brainer on this one; while an iced tall non-fat caramel macchiato is only 140 calories, it contains 25 grams of carbs, and I’d way rather put those carbs towards some fruit this time of year. A tall light coffee frappuccino is only 90 calories and 20 grams of carbs, but really…who ever gets a tall? I could slurp that back in one gulp. And the seemingly harmless iced coffee with milk? 180 calories and 36 grams of carbs for a venti. Thankfully I take mine black. But in addition to my desire to not drink all of my calories, I also want to keep my caffeine intake on the lower(ish) side. After a late night at work, early morning training sessions call for a cuppa’ Joe before I head out the door. Likewise, when I’m sitting at a table writing programs all morning, there’s something comforting about having a cup of coffee. Then on my way to the hotel I usually stop at one of the 8 million Starbucks I pass on the way to pick up an afternoon brew. This is due more to “yummy-treat” factor as opposed to the “dear God I need caffeine” factor. SO I had a genius idea. Mornings are usually my “dear God I need caffeine” time. So WHAT IF I made my morning brew just as delicious as the afternoon treats I’ve been spending countless dollars on each week? 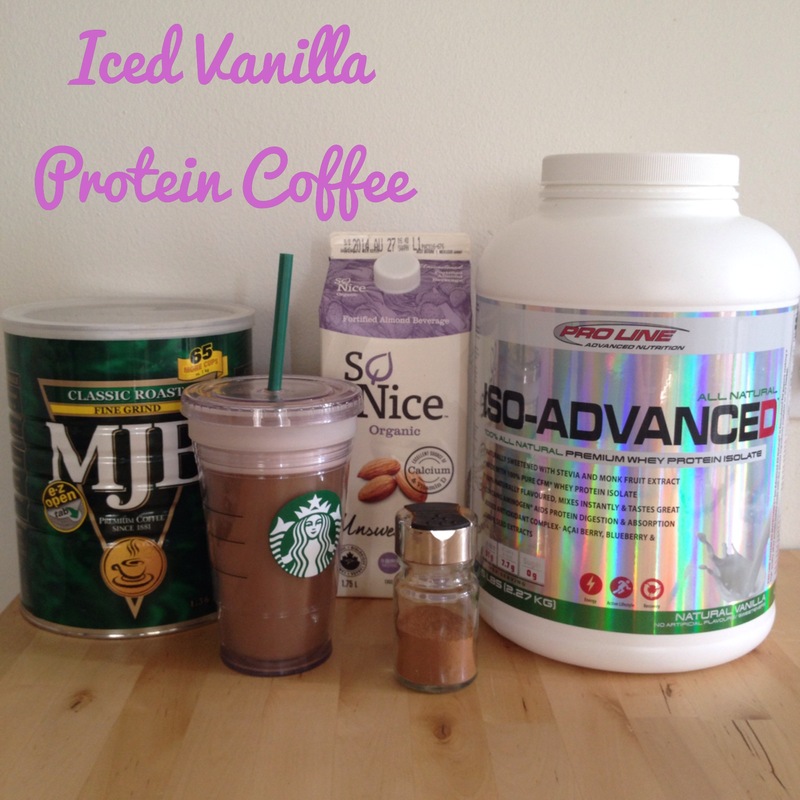 So lo and behold, the Iced Vanilla Protein Coffee was born! This tasty little brew has saved me calories that I can put towards more satiating things and money that I can put towards more important things, like Lululemon & different flavours of whey protein 😉 I hope you enjoy it as much as I do! 2 cups coffee – since Jordan wakes up earlier than I do, I get him to make extra coffee so it’s cold by the time I’m awake. If you’re not a fan of drinking coffee that’s been sitting out for an hour or two, you can put some fresh-brewed coffee in the freezer for a little bit. Just be careful not to use glass…you don’t want it to crack! Pour coffee into a blender, then whey, then cinnamon, then almond milk. How bout you readers? Have you come up with any drinks to combat your Starbucks addition? What’s your fav drink? Anyone tried the #Blendicano that’s all over Instagram? 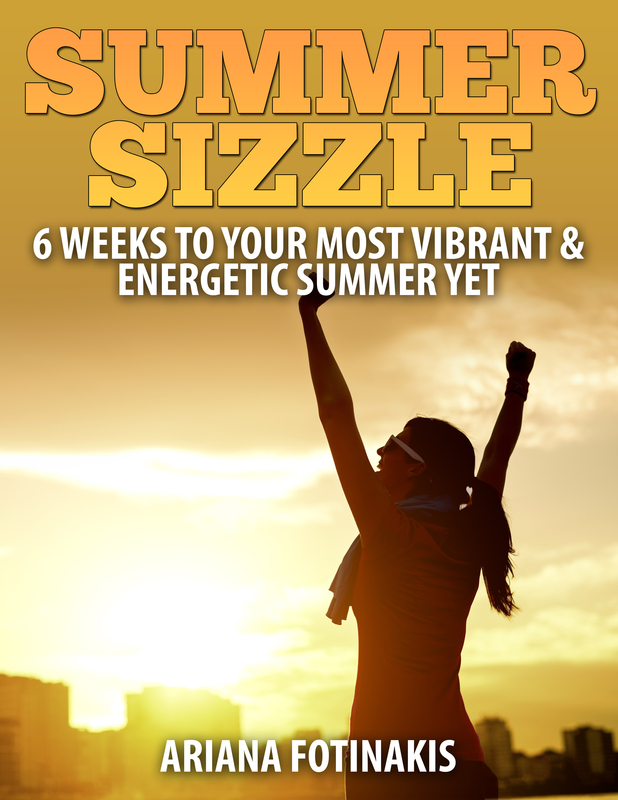 This entry was posted in Food and tagged clean eating, coffee, diet, fitness, food, health, healthy-living, nutrition, recipe, recipes, starbucks, summer, vancouver, weight loss. Bookmark the permalink. I normally have a few sips of coffee before my workout and then throw away the rest afterward because I don’t like cold coffee. Arrived in the office, I drink my smoothie and then head down to Starbucks for my intake of caffeine. I like the caffeine and smoothie combination idea, especially in the summer! Thanks. Great!! I hope you like it! Do you have any recipes you enjoy you’d like to share? My favorite is just to add a bit of vanilla almond milk. Or I’ve added extracts as well too! Yumm I love almond milk in mine, too! I like my coffee hot in the mornings- just seems normal but this sounds like a fun treat to try in the afternoon! Oh..I am OBSESSED with Starbucks! But..I have to say…”frou frou” coffee has never been my thing. I just get a regular coffee…boring, I know! An occasional Iced Coffee is on my list as well!! But I DO like the new FIZZIO!! Not boring at all! Sometimes nothin’ beats a delicious cup of fresh-brewed coffee 🙂 What’s Fizzio?? Sounds fun! OMG! Trust me when I say..you owe it to yourself to try ! There the new crafted carbonated drinks they have at Sbux. Ginger Ale, Lemonade, and a Spiced Root Beer. It’s been PERFECT in this HOT FL heat!! Totally stealing your coffee recipe! 😉Thanks!! Oooo that sounds really interesting! I wonder if it’s only available in the States…I haven’t heard of them here and I’m a frequent visitor of Starbucks’ 😉 I hope you enjoy the coffee!! I will THANKS!! I didn’t even think about the idea of the Fizzio not being available there! Keep your eyes open for them…I think you’ll like it!! Usually, I just give in and drink coffee – there is no fighting the addiction! But I like to go hot all year long – I guess I’m a creature of habit! I totally feel ya on that! I’ve been making your ice coffee in the morning and pack it in a good quality thermos for a ‘pick me up’ mid afternoon at work. I also mix 1 tbs of chia seed with 1/2 cup of soya milk the night before and let it sit in the fridge. Blended it with the rest of the ingredients in the morning. I’ve used also good expresso powder used in baking instead of leftover coffee.